The logwood tree (Haematoxylum campechianum) also called Blauholz (bluewood) in German and otherwise known as the Campeche tree (because it grows in the vicinity of the city of Campeche in Mexico), belongs to the subfamily of the Caesalpinioideae), a subdivision of the Fabaceae family. It is a deciduous tree native to Central America and the northern regions of South America. It is a source of logwood (Campeche wood, lignum campechianum in Latin, bois de campêche in French) which is the most important of all dye woods. In many tropical countries, this species is an invasive plant. Also known as bloodwood, the logwood tree is an evergreen tree or shrub, frequently found with thorns and growing to a height of 3 to 10 metres. It has a red heartwood (hence bloodwood, and the botanical name Haematoxylum). The wood has a faint scent of violets. The alternating doubly pinnated leaves are 2.5 to 7.5 centimetres long, with three to five pinnated pairs, which vary between 1 and 3 cm in length and 1 and 2.5 cm in breadth. The flowers grow in a grapelike cluster. 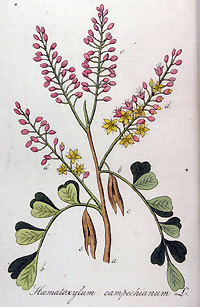 The blossoms are yellow, scented and hermaphroditic, with a diameter of 12 to 16 mm. The pods are between 4 and 6 cm long and 0.8 to 1.2 cm broad, and contain two or three brown seeds, each with a length of 5 to 7 mm and a diameter of 2 to 3 mm. At the end of the 19th century the tree began to be cultivated in the Dutch colonies of the East Indies. When freed from the whitish sapwood, the big blocks are a dark blood red to brownish red on the outside; within they are a lighter colour, reddish to yellowish brown, but gradually darkening on exposure to the air. The wood is hard and dense, and is difficult to split. It has a faint scent, distantly resembling that of the violet, and an astringent taste. A distinction is made between Campeche wood properly speaking or Laguna Campeche, Jamaica logwood and Domingo logwood; of the latter in turn there are several varieties, namely Monte Christo, Fort Liberté and Aux Cayes. Martinique and Guadeloupe logwood are inferior strains. The substance that makes logwood effective for dyeing purposes is haematoxylin. In its purest state it forms almost colourless crystals, but when exposed to the air these quickly develop a reddish colour and finally yield the actual dyestuff haematin. Because this dyestuff is present in the freshly grated logwood only in small quantity, it is allowed to ferment through exposure to the air, as a result of which it develops the desired colour; the best quality chips then show a curious metallic yellow-green sheen. Logwood extract, prepared from logwood, is also an important article of trade, sometimes supplied in solid and sometimes in liquid form. The solid extract used to come from New York, in chests weighing 50 to 100 kilos. The most popular brands were Sanford, Aroma Mills, Boston and Gravesend Mills. Logwood was used in dyeing and for the production of ink. It also featured occasionally in medicine, or domestically in the production of fine furniture.